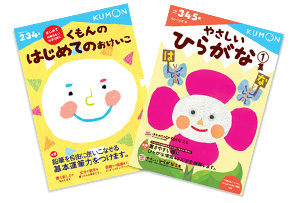 Kumon's books and educational toys develop children's life skills through reading, learning, and playing. 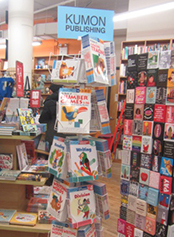 Kumon Publishing develops and markets picture books, children's books, workbooks for preschoolers, study-aid books, as well as educational toys and merchandise. Our mission is to make a contribution to children's futures through our publications and education-related products that develop children's ability to learn. These products, after being tested in actual educational situations, have received highly positive evaluations in the marketplace. We want to deliver joy to as many children as possible. We also hope to further enrich children's futures. These wishes of ours are incorporated into each of our picture books. Our greatest pleasure is to see family members enjoying active communication with one another, and to see children filled with the warmth of affection, by reading our picture books. Through the reading of books, we want children to gain a wide variety of knowledge and to develop a well-rounded character. We hope that children become book lovers and develop the ability to think and act on their own when facing difficulties by applying the wisdom and knowledge obtained from the books that they have read. These are the wishes that underlie all of our children's books. Through joyful communication between parent and child, we wish to expose children to a high number of words and numbers. And, through the development of enriched communication, we hope to see big smiles on the faces of all family members. Our flash cards are created with these wishes in mind. We used the knowledge acquired from the Kumon worksheets to design various workbooks for preschoolers. Our workbooks help children to easily and enjoyably acquire basic study elements, such as letters, words, and numbers, as well as improve manual dexterity through certain activities, such as cutting, pasting, and folding on their own. The know-how of Kumon worksheets is also utilized in our workbooks for elementary school students, which cover such study topics as addition and subtraction. They help children self-learn each topic from basic to advanced levels. We also provide study-aid books, which ensure that elementary school and junior high school students develop basic academic abilities, and dictionaries for preschoolers, elementary school students, and junior high school students. Kumon's educational books and general books cover many topics, from child-raising to topics of interest for adult learners. Through these books, we want to share with as many mothers and fathers as possible the wide variety of information that Kumon has specifically acquired through its activities in order to enrich children's lives. Kumon's educational toys develop the brains of children because playing with them requires children to think while using their hands, and vice versa. Each toy has only a few selected functions, enabling even infants to enjoy playing with them while they develop their ability to concentrate. The publications of Kumon Publishing, spearheaded by Kumon Publishing North America (established in August 2004), have been translated into a variety of languages, including English and Spanish, and are used by children in 60 countries and regions around the world. 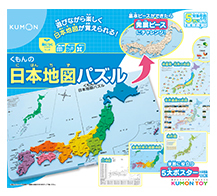 Hearing a staff member of Kumon North America comment on the high quality of Kumon's Japanese workbooks for preschoolers led to the initiation of publication activities outside of Japan. There were no similar products comparable to ours in terms of quality in North America previous to this launch. We launched our publishing activities there because we wanted to help children in North America to become self-motivated and to develop their abilities through enjoying our workbooks.